The fate of the US dollar exchange rate is now entirely dependent on payroll figures. The Fed has announced that Quantitative Easing will start on the road to being history when unemployment hits 6.5%. It now stands at 7.6%. The currency market has already begun to price in the ending of QE and, barring a major upset, the question is not if it is going to end, but when. So those of us who trade currencies seek an indicator to let us know the answer to that question. Can it be found in the trend of the dollar against the Euro? Most certainly not. This is the worst of all predictors, for the simple reason that Europe has its own problems and its own motivation to ensure that this rate follows an agenda that has nothing to do with the greenback. Can it be found in the trend in bond yields? Perhaps, but here again we are dealing with a complex set of circumstances in determining the significance of those figures at any given time. There is one chart that might just fit the bill, however, and that is Gold. As it has long since lost any real tie to the value of the major currencies and as it has no industrial utility, unlike other precious metals such as, for example, platinum, which is used in catalytic converters, its only role is as a hedge against depreciation of the US dollar. Therefore its fate on a month to month basis does indeed have the potential to tell us what we might need to know. So there you have it. A US dollar currency rate prediction kit comprised of the Gold narrative over time and the monthly employment figures. All else is dependent on these. 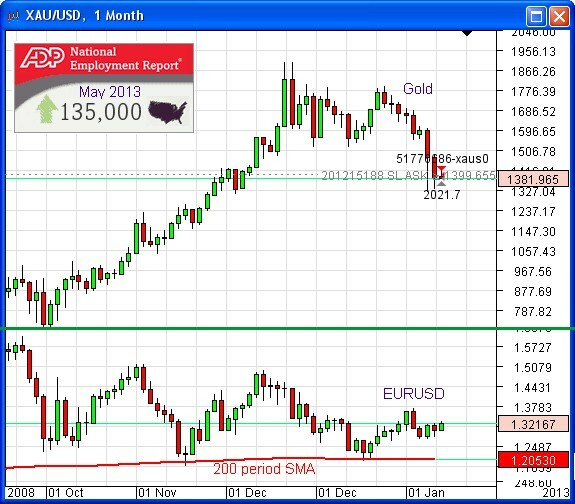 The Omicron Forex Silver Trigger Algorithmic routine has already entered a short position in Gold. It had been active and waiting for a trade trigger for some six days prior to the Non-Farm Payroll release last Friday. Immediately after the announcement it registered enough momentum to trigger entry to the trade, which has already reached its first profit target and has had its Stop Loss moved to Break-Even.